This entry was posted on May 1, 2014 at 9:36 pm	and is filed under Calpe Towers, Forward Patrol. Tagged: Calpe, France, Prussia, Saxony. You can follow any responses to this entry through the RSS 2.0 feed. You can leave a response, or trackback from your own site. As always, new calpe news is good Calpe news. Im especially happy to see the saxons now on the site… the paint job Peter has done on them is just phenomenal. Hopefully the artillery crews will follow in short order! Be great to have those French gunners done to accompany those beaut French guns – that Gribeauval 12 pdr reminds me of happy days spent fondling one in the courtyard at Les Invalides…Mind you those advancing Saxons with uncovered shakos look pretty good too! Although, it looks like the Calpe website has gone missing. Grrrrr. Odd, it’s working for me this morning. It’s up for me now. This is going to be a problem. I haven’t painted any Napoleonics in years. I had been waiting for the French march attack figs and drifted off to other areas. Now, here they are. I guess I’ll just have to get going on Napoleonics again. 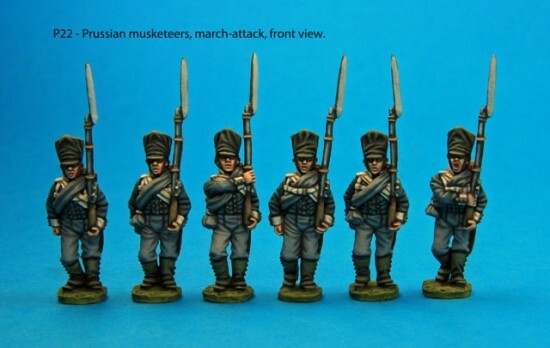 Why are the Prussian Grenadiers no longer on Peter F’s listings?? Off the top of my head, I’m not sure. To be frank, I hadn’t noticed their disappearance. I’ll check with Peter F and get back to you. I asked Peter F about this. The Grenadiers are still available. They fell in between the cracks when the new website was designed. You can order them by simply looking at the new musketeer figures on the main part of the website and adding a G to the code. So P4 would become PG4 and so on. guys any sign of prussian kurassiers ever appearing? Peter needs to get the site updated, it’s not doing justice if he has a range such as the Prussian Grenadiers unlisted Martin.